Comparison of Alpha Toxin of Staphylococcus and Aerolysin for Formation of Ion-Permeable Channels. Apamin: A Probe for Low Conductance, Calcium-Activated Potassium Channels. Batrachotoxinin A [3H]Benzoate Binding to Sodium Channels. Botulinal Neurotoxins: Mode of Action on Neurotransmitter Release. Botulinum Toxin as a Tool in Neurobiology. ga-Bungarotoxin Receptor from Chick Optic Lobe: Biochemical, Immunological, and Pharmacological Characterization. Channel Ligands Used to Probe Role of Voltage-Sensitive Calcium-Ion Channels in Neuropeptide Release. Modulation of Acetylcholine Release by Calcium Channel Antagonists. Capsaicin: A Probe for Studying Specific Neuronal Populations in Brain and Retina. Charybdotoxin in Study of Voltage-Dependent Potassium Channels. Ciguatoxin: A Tool for Research on Sodium-Dependent Mechanisms. Purification and Radiolabeling of Clostridium botulinium Type F Neurotoxin. Retrograde Tracing with Cholera Toxin Bb1Gold or with Immunocytochemically Detected Cholera Toxin B in Central Nervous System. gu-Conotoxin: Calcium Currents and Neurosecretion. gu-Conotoxin GVIA and Its Receptors. Dendrotoxin Acceptor Sites: Identification and Labeling of Brain Potassium Channels. Endothelins and Sarafotoxin in Neural Tissues. Fasciculin: Neuropharmacology of Potent Anticholinesterase Polypeptide. Geographutoxins. Presynaptic Activity of ga-Latrotoxin: Purification and Properties. Natural Toxins in Study of Degeneration and Regeneration of Skeletal Muscle. Neosurugatoxin: A Probe for Neuronal Nicotinic Receptors in Adrenal Medulla, Brain, and Ganglia. Neurotoxins as Tools in Characterization of gg-Aminobutyric Acid-Activated Chloride Channels. Palytoxin: Characterization of Mode of Action in Excitable Cells. Palytoxin: Mechanism of Acidifying Action in Excitable Cells. Pertussis Toxin in Analysis of Receptor Mechanisms. Resiniferatoxin. Scorpion Toxins Affecting Insects. Potassium Channel-Blocking Toxins from Snake Venoms and Neuromuscular Transmission. Each chapter includes references. Index. The exquisite simplicity and potency of toxins have made them valuable probes of neural systems. 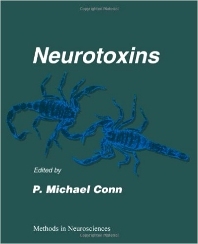 This book presents a comprehensive compilation of techniques used for the preparation, handling, and, particularly, for the use of neurotoxins. Model systems are described in which these neurotoxins have been extremely valuable in developing an understanding of the cellular and molecular basis of secretion and electrophysiological events leading to altered cell function. Neurochemists, neurophysiologists, neuropharmacologists, neuroanatomists, neuroendocrinologists, molecular biologists, cell biologists, geneticists, biochemists, microbiologists, and developmental biologists.